After dominating amateur golf, Jack Nicklaus turned pro and won his first of four U.S. Opens in a duel with Arnold Palmer. 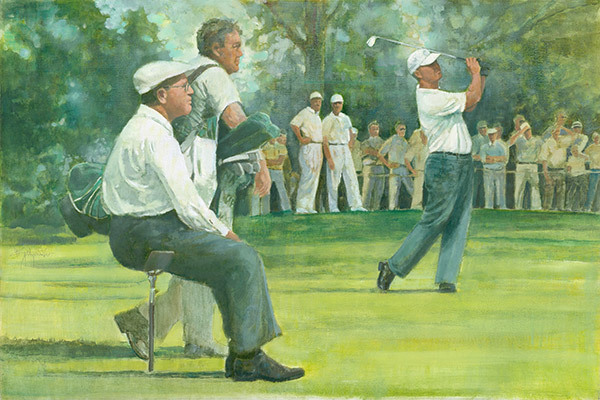 In a duel for the ages, Jack Nicklaus faced Arnold Palmer, considered one of golf history’s most popular players, at Oakmont Country Club – just 35 miles from Palmer’s birthplace and home. Tied after 72 holes, the two met in an 18-hole playoff on Sunday. As he had all week, Palmer played exceptionally well from tee to green but struggled on Oakmont’s treacherous putting surfaces. Nicklaus, who liked the demanding course and was comfortable with the United States Golf Association’s U.S. Open set-up, jumped out to a four-stroke lead but Palmer staged yet another of his memorable charges, making birdies on the 9th, 11th and 12th to close to within one. But a three-putt bogey on 13 was his downfall and Nicklaus won by three strokes. It was fitting that this Open not only established one of the greatest rivalries in sports but cemented what would prove to be a long and enduring friendship.